Come check out the latest installment of Disasterpiece Theatre on Thursday 5.30 at 8pm at High Energy. Disasterpiece screenings are always free, the films are always terrible, and everybody has a good time. VHS donations to the stores super secret VHS swap shelf are welcomed Please RSVP on Facebook, or send us an email if you plan to attend! 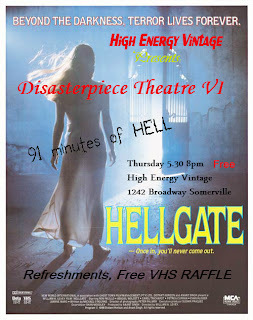 Disasterpiece Theatre is continuing series of seriously bad films exclusively shown on VHS. We will have refreshments, and a free VHS raffle.